Denise le Menice (AKA Perth’s Ali Flintoff) has made a name for herself as the razor-tongued lead singer of punk rock outfit BOAT SHOW. Ali is now channelling her pop sensibilities and trademark wit into her solo project Denise le Menice. Citing influences from early Dandy Warhols and latter era Kylie Minogue, ‘Heart’ is as satisfying as guitar pop gets - two and a half minutes of vocal harmonies and dream-pop/shoegaze confection - which virtually bursts out of the speakers. 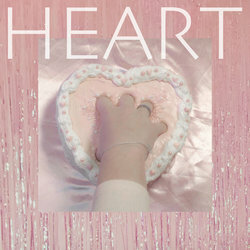 ‘Heart’ comes with a sugary sweet video. Directed by Eden Barlow and converted to VHS, it is a supreme throwback to the early 2000’s; featuring lava lamps, portable CD players and wait for it… a landline cord phone (but also features an iphone 7 to bring you back to 2018). Having played the WA leg of 2017 Laneway Festival, and spent the year touring with BOAT SHOW, – Ali is a seasoned performer. Throughout November, Denise le Menice will also be supporting Phil Jamieson on his national tour of Australia.